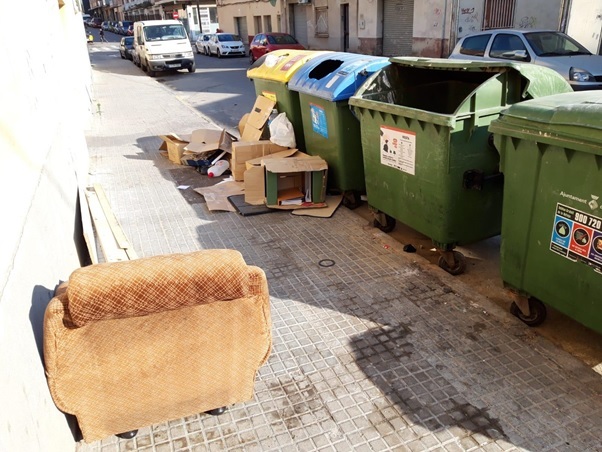 The garbage containers in the Vallès Occidental area are overflowing or there is garbage on the ground because of people's lack of awareness when it comes to recycling. Sometimes we find the containers overflowing and garbage out of them. Why? We might think that this is because citizens are lazy when it comes to putting garbage inside the container. But the correct question would be: do the city’s councils have a correct waste management programme? Do the trucks empty the containers frequently enough? How often are the streets cleaned? Are there enough litter bins? The truth is that when there has been a worker’s strike or during times of maximum consumption, for example Christmas, we are all aware that it is necessary to reinforce these services and on most occasions this does not happen. These acts have their consequences, since they have a major impact both visually and environmentally. Concerning the former, we know about it because we see it with our own eyes, but the latter, and more important, creates consequences of which we should be more aware. One of the consequences is what happens with the plastic waste since it can be easily swept away by the wind and can end up in a river, on a mountain, in a forest or in the sea with the result of having a negative impact on the ecosystem of the area. According to the Residue Agency of Catalonia (ARC), in 2017 we produced 1.12 kg/inhabitant trash per day, which means 409.8 kg/inhabitant of trash each year in the Vallés Occidental region alone. In total, amongst industries, shops and homes, 28,006.06 tons of organic matter, 15,940.63 tons of paper and cardboard, 12,213.64 tons of glass and 12,518.88 tons of plastics was produced. Around 50% of the garbage produced goes to garbage dumps where it is not recycled, when the objective of the European Commission of Waste in Spain is to recycle 70% of urban residues and 80% of plastics by the year 2030. We produced 1.12 kg/inhabitant trash per day, which means 409.8 kg/inhabitant of trash each year. We interviewed several residents in Sant Quirze del Vallès and their common opinion was that we are all responsible for this issue. That is to say, the streets are not full of garbage just because of the fact that garbage trucks do not empty the containers more often, but because citizens, whether it is by their action (sometimes we do not act civically by leaving the trash outside the container) or by their omission (not reporting a full container to the city council so they can empty it), are not aware of the importance of recycling. An interviewee told us that he had seen people that did not even get out of their cars, but threw their thrash out the window. The photo above highlights perfectly what we are referring to. Litter on the ground and containers that are not yet full, but some residents choose to leave their trash in front of the container instead of in it. Unfortunately, this happens on a day-to-day basis even though the majority of people do not like to see rubbish littering the streets. In view of this situation, what alternatives do we have? Developing a door to door garbage collection system, increasing the size of the trash containers, introducing more fines, motivating companies and consumers to reuse and/or return bottles or packages, and above all, making people aware of the importance of recycling, could be some of the solutions. AUTORAS: Martina Montefusco y Marta Segovia. European International School of Barcelona.